The ninth century stone lion on the burial mound of Ralpacan (ral pa can) in the Chonggye valley. To the left is Richardson's local monk guide and on the right, Sonam Tobden, Richardson's travelling companion on this trip. The monk is wearing robes with an outer jacket and and a bag slung across his shoulder. Sonam Tobden has a fur and brocade hat on his head and is dressed in a light coloured chuba robe. It is possible to see another burial mound, possibly that of Mes Ag-thoms, behind him. There are two light strips on both edges of the photograph. 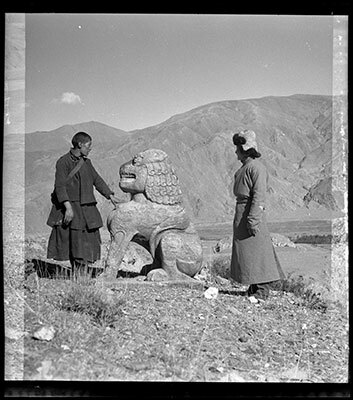 Other Information - Setting: Richardson discusses the significance of this stone lion in High Peaks, Pure Earth , London, Serindia Publications, 1998, p. 227. " ... there has survived one small but precious relicfrom the days of the chos-rgyal . On top of the mound attributed to Ral-pa-can I found the stone figure of a lion ... . The identification of the mound depends primarily on the statement of my monk guide, but it agrees generally with the literary description of the tomb ... . At all events, the lion now stands on the mound claimed to be that of Ral-pa-can, which is furthest to the south of the whole group of tombs ... . None of the Tibetanas of Lhasa - lamas, nobles, ordinary monks and laymen - to whom I mentioned the astone lion had ever seen or even heard of it. So the figure survived, remote and forgotton, protected from the sling-shot of some thoughtless shepherd only by the awe and sanctity of the place. The damage to the right foreleg, ... may have been caused by grave-looters and it is possible that there were originally other similar figures on the mound ... . There appears no reason to doubt that the lion dates from the time when the site was used for royal burials; and by associating it with Ral-pa-can, who died in c. 842, it is placed near the end of that period. ... Sculpture in the round, of any period, is rarely seen in Tibet, but old records indicate that in early times the carving of stone figures was not uncommon." The Tibet Album. "Stone lion on burial mound of Ralpacan in Chyongye valley" 05 Dec. 2006. The Pitt Rivers Museum. <http://tibet.prm.ox.ac.uk/photo_2001.59.15.71.1.html>.